Serlog also includes all the standard statistics and reports that you would expect from a server log analyzer: hits, sessions, visitors, browsers, platforms, spiders, bandwidth, countries, entry/exit pages, errors, search engines, and more. There is a gold mine of information in your logs. Can you afford to ignore it? Serlog reports the number of visitors that other websites are sending your way ("referrals") and how many of those visitors are turning into paying customers ("conversions"). This is very useful for determining where advertising might be effective, where it is paying off, and where it is being wasted. Without this knowledge, your marketing resources will be used much less efficiently, and your business will lose sales. Serlog reports the number of referrals for each search keyword. The keywords can be isolated for individual pages. This allows you to determine which keywords should be targeted by pay-per-click campaigns. Serlog also reports the total number of referrals for each search engine. This allows you to concentrate your pay-per-click participation on the search engines that send the most traffic. Because you have more than one product, the scope of all reports can be limited to a set of files, or an individual file. This allows you to get focus on what keywords and referrers are driving sales to each of your products or pages individually. Most of Serlog's competitors lack this crucial ability. Serlog is a desktop application that runs on 64-bit Windows (XP or later). Does not require any modification of the website. Does not require any software to be installed on the web server. 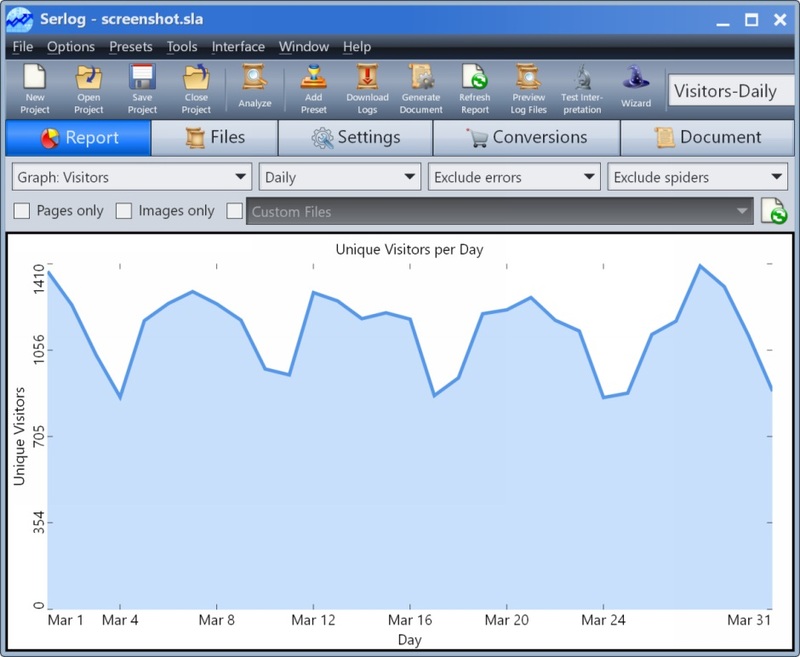 A document containing a customizable set of reports can be generated. This document can be in two formats: a set of HTML files and images, or it can be compiled into a single, self-contained CHM file. CHM files can be opened on any system that has Internet Explorer 4 or later. Downloads logs from an FTP server. Graphs can be divided by days, weeks, or months. Day of Week and Hour of Day modes are also supported. Errors and spider traffic can be excluded from reports. Erroneous referrals can be reported. This is useful for informing other websites that they have broken links. If the log file format is not one of the available presets, and auto-detection is not possible, you can manually configure the format. This allows Serlog to analyze a wide range of uncommon formats. The "Test Interpretation" tool assists with the manual configuration. Supports log files that are compressed inside of .ZIP, .RAR, .BZ2, .GZ, and .TGZ archives. The settings used to generate a single report can be saved to a "Preset" for later retrieval. The data files used to detect browsers, platforms, search engines, and spiders are simple text files that can be modified by the user. All of the settings used to perform the log analysis can be saved to a "project" file. Click the button below to download Serlog version 15.0, released January 8th, 2019. Microsoft Windows 64-bit is required (XP or later). The download is a fully-functional 30-day trial. The download is an executable installer. Simply open the file to begin installation. The download is approximately 12 MB and installation will use approximately 50 MB of hard disk space. If you prefer to download the installer inside of a .zip file, click here. To update an existing installation, simply install the new version over the old one. To purchase a license for only $79 U.S. please click the button below.